Humans Take On Computer In Jeopardy! In 1997, there was a very famous chess match. The world champion chess player, Gary Kasparov, went up against a special challenger: a computer. The computer was called “Deep Blue” and it was built by IBM just to play chess. Deep Blue won the six-game chess match. This year, IBM came up with a new challenge. They decided to build a computer that could match wits with two humans on a game show called Jeopardy!. The computer is called Watson, and its “brain power” is equal to thousands of home computers. Playing chess is something computers can do very well because it relies on quickly deciding between different moves. However, answering questions and understanding English is not something computers do well. 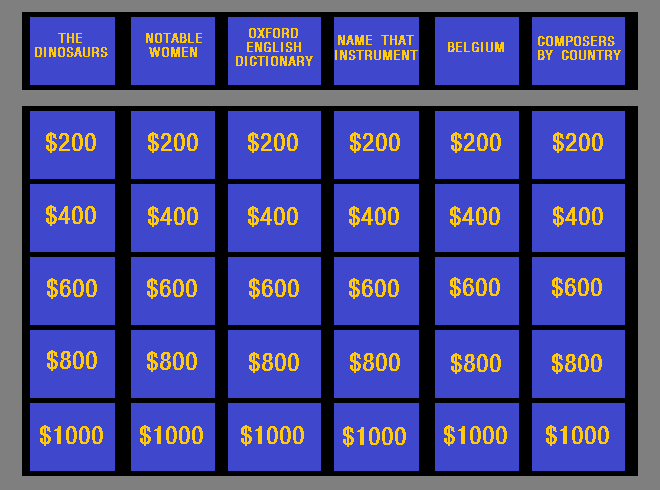 In Jeopardy!, the questions may include riddles, puns and cultural references. These are things humans are good at, but computers are not. That’s because human language often uses pictures – metaphors – that don’t always make sense when they’re taken at face value. For instance, if you said, “I ran like a deer!” your friend would know that you ran fast – not that you had four legs or were running through a forest. Computers need to “learn” those kinds of word pictures. IBM wanted to prove they could make a computer that could understand many difficult things about the English language. Watson took on Jeopardy!’s two biggest all-time winners: Brad Rutter and Ken Jennings. It took four years to get Watson ready to play humans on Jeopardy!. Its memory banks are filled with encyclopedias, the Internet movie database, New York Times articles and the Bible. It also knows thousands of correctly answered Jeopardy! questions. Its largest airport is named for a WWII hero; its second-largest for a WWII battle. Watson answered: Toronto. Toronto? That’s not even a US city, it’s the capital of Ontario, Canada! How could Watson have gotten that one so wrong? It turns out that Watson was programmed to not think very much about the category, so it wasn’t really thinking of a US city – it was focused on the WWII part of the question. Both humans answered correctly: Chicago. In any case, Watson went on to win that game. In the second game, Watson knew most of the answers, but was just too slow buzzing in so the humans got a lot of points on him. The fact that humans could figure out answers and buzz in more quickly than Watson, an extremely powerful computer, shows how complex the human brain really is. By the end of game two, Watson had won the match with more than $77,000. Jennings came in second with a two-game total of $24,000 and Brad Rutter came third with $21,600. What’s next for Watson? Watson’s Jeopardy! win is historical. It means that computers can do much more than most people thought they could. Watson’s “brain” will now be used in hospitals to diagnose and treat patients. It will also be used to give doctors information. To read more about Watson, how the computer was built, the Jeopardy! challenge and to see videos visit: www.ibmwatson.com. Today’s article ends by explaining that, “Watson’s “brain” will now be used in hospitals to diagnose and treat patients.” Would you trust “Watson” more or less than a human doctor? Why? What skills does a human doctor have that a computer does not? What advantages does a computer provide that a human does not? Have you ever watched Jeopardy! before? If you have, your ability to understand today’s story was likely improved. The reason is, when readers try to understand texts, they think about what they already know (activate prior knowledge). In this case, if you already know about the show Jeopardy!, your mind can concentrate on new, important information. A good strategy to help with your comprehension is to ask yourself questions about your understanding before, during, and after you read. But the most interesting usage of the exclamation point might be in the title of the TV trivia show, Jeopardy! (the word jeopardy means danger, risk, hazard). Why do you think the creators of Jeopardy! put an exclamation point following the name of their show? Do you think using an exclamation point was a good idea? Do you think it changes the way someone would feel about the show?